I can only assume that the planners, inspectors, and developers responsible for this home were not focusing on the site. This steep, once wooded, million-dollar-view piece of property along Chuckanut Drive (near Larabee State Park) was once stunningly beautiful. A house was built, not stunningly beautiful. The trees and woodland under-plantings that once worked as habitat while protecting the bluff from erosion were mostly removed to make way for parking, house, drainfield and a more open view. The forest, once on this site, is gone along with it's function. The job of the forest was to slow down the rain, plus the uphill runoff, to curb erosion and recharge the aquifer. It was the "sponge" that protected the bluff with the roots binding the bluff. Not any more. It's lost both its function and much of its beauty. Now there is a parking pull out along Chuckanut where guests can park before they descend the 'wall' to the front entrance. The main entrance is between the two gable roofs and not visible in the above photo, but is to the left. While I love the look of a well detailed angle, the diagonal supports for the decks do not qualify. In fact, to me, it was a lost opportunity. The vertical element of the remaining trees is the language on this site. A language to be repeated. Rather, the diagonals are analogous to the failure of this building on this site. And, when you have such a beautiful site, why skimp on the stairs (below). The design was all about the view out the windows and not the site itself. People oriented to the out of doors would need to walk all the way around their house and down very steep, poorly constructed steps, to access their land. This house would not be purchased by a person concerned with the environmental integrity of our land. But the real scary thing here is how the roof, site and road water are handled. It's best to slow down fresh rain water giving it time to be used by plants and animals and the land. Instead the water generated by the roof, road, and parking is flowing to a location below the house. But, there are railroad tracks between the house and the Sound, so it would appear the water is being released on the bluff impacting the safety of trains before it finds it's way to salt water. Cheryl's deer fence taking shape. First clearing of the path. It's a little tight under the willow tree but preserving the native vegetation is important on steep sites with fill. 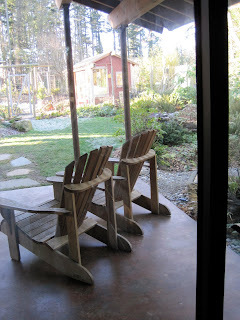 We used round wood posts from Skagit Farmers supply. 2-3" by 10' posts worked in most places but 3-4" posts were used at corners and soft spots. Hoping to create a fence that will stand straight and be functional for at least 2 decades, we tightened our centers on the posts and used a few more but made a much stronger and more attractive fence. Digging holes on steep terrain and in sand has definite drawbacks. We avoided collapsing holes by driving all our posts. Jimmy of Irish Welding super sized a fence pounder for me. It's made of 5" schedule 80 pipe with a 3/4" plate welded to the end and solid 3/4" rod handles. It weighs about 80#'s. Needless to say, it has some bumping power! Two people needed on the 10' tall posts. Josh and Joe take a break from pile-driving. An initial sketch of Jimmy's house. Schematic design is a must and very few people understand why. The simple exploration of ideas, site, structure, materials, client needs, community,... are all so important. They begin to establish a language you use to inform all design decisions along the way from location of building on site to locations of handles on cabinets. At design build brad the products evolve but the language remains the same (once clearly defined during schematic design). This allows for change, improvement and adaptation while keeping the design centered and simple. Above-a sketch of Jimmy's house by Brad Hankins--first one!! Below-Jimmy at Irish welding unloads the heavy steel boiler plates which were purchased for a fence awaiting fabrications. The site for his house is less that 50' away. Being a man of steel, Jimmy wants to build a moment frame! 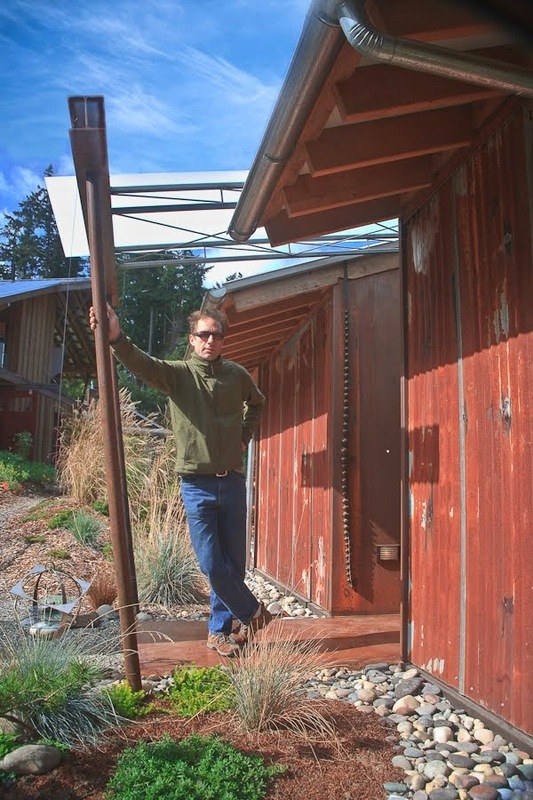 This is a structural system not typically afforded in residential construction and I'm delighted to explore the design opportunities allowed by a steel moment frame house in the tree tops!! Our language here is cantilever, bending moment, deflection and overturning. Our materials are steel, concrete and a beautiful live/work site. Below is another example of a sketch informing an entire design process but not driving/forcing it. Above- is a sketch early on of FrEdLey's project. Below-FrEdLey project finished. Photo by Lois Mason. Through schematic design exploration we lived with the idea of separate buildings and a tower. After two weeks of eating cereal on it (laminated copy) we nixed the tower but the separate buildings were a given! I expect to see similar improvements happen as Jimmy's place evolves! Travis is back for 3 months from university where he studies construction management in architecture. He will be working as an intern for dbBrad during this time. Travis has worked for me during the last 3-4 years when not in school. We have solid work right now for the crew so Travis will be working with me in the office learning the other side of construction. He'll be helping me do drawings, site plans, as-builts, pricing, permitting with Island County and the City of Langley, detailing and marketing. Beyond this we'll be putting together all the answers for all the questions associated with the building of 4-6 cottages in Langley. Carl, Travis and Brad, left to right. Seems a fitting picture as Carl was and continues to be my mentor. dbBrad has a brand new project. A large pond and wetland fed by water from surface runoff, french drains and the roof of the house. This brand new house sits on land freshly disturbed from construction and has had some flooding issues. It's at the bottom of a large long hill that was badly damaged during clear cutting and has since has been aggravated by homes and roads creating a severe water problem. Elliott Menashe of Greenbelt Consulting was first on the scene and referred the clients to Design Build Brad and Fran Abel Landscape Consulting . It is always a pleasure to work with Elliott and thank you. The land around the house is a bit sterile right now. Fran has put the land in a repair/holding pattern with cover crops while we work on the logistics of repairing the land's ability to absorb water. This project is currently a combined design build effort with Fran Abel as the primary designer and dbBrad as the contractor. However we have a great working relationship as I understand the need to be sensitive to the landscape and she understands architecture. And she's a wonderful mom too! View of back portion of property. This small gully will become a lined stream and drain down to the grassy area where the pond will be. Below that the large wetland to give the land and water and plants time to mix it up! The site is large and will mostly be restored to the wetland forest it once was. Stumps of very large trees are reminiscent of the massive forest that used to be there. It is this area behind the house void of vegetation but rich with opportunity where we well begin phase one of the repair to the land and it's ability to handle water. After years of seeing mailboxes fall over, realtor's using a post-hole digger to set a sign and painted plywood job-site addresses nailed to trees, I decided I needed a sign that was as easy to assemble and transport as it is attractive and durable. These rails are a common channel profile out of mild steel. Easy to drill and cut. Two holes with a jig saw crafted the slots. A grinder cleans up the material and cuts the tenons. I build fences once every few years. I just built a deer fence and had my red pounder out. A simple underused tool I decided to employ! Nothing easier than driving 30" of sharpened steel into the ground!! After pounding the poles correctly spaced (+/- 1/2") the legs are still a little flimsy. This allows them to easily deflect for inserting the tenons. Still wobblie at this point, simple bungee/ball loops for tarps are used to stretch the sign inside the frame providing the tension necessary to hold it all together. No mechanical fasteners at all. Four signs have been up now for over a month and they are straight and tight as when installed! As always, the simple solution (though a little more complicated initially) always prevails in good design. Sometimes the process of a project is as fun as the finished project. 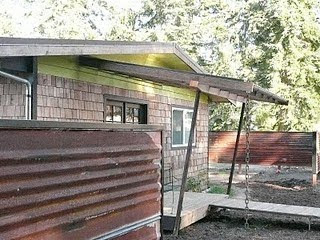 This is proving to be the case with my latest design build project-Cheryl's Fence! We're having a great time evolving and refining the design. Above: A mock up of the materials for Cheryl the Artist's Fence including woven wire mesh left over from FrEdLey's, salvage cedar posts with angle iron corners and steel boiler plates! Below: Brad and Josh admiring our work after a day of assembling railings on FrEdLey. However, sometimes these processes are overwhelming. Cheryl is taking the weekend without the moch ups, the crew or dbBrad to think about it. It's a lot of money to design and build a custom design durable enough to last for 50 years, beautiful enough to hold it's own as the first thing you see, practical enough to keep the deer and rabbits out and unique/special enough to be a functional piece of art. A big piece of art at that. Perfect for an Artist! This door (tucked behind the screen), with covered space for contemplating one's work even on a rainy day, opens into a studio. A previously dark, unventilated dining room and kitchen now open onto a small deck for outdoor living. 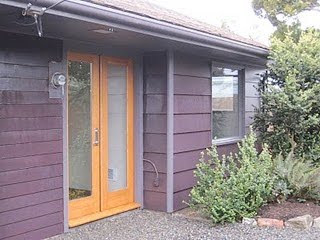 These doors give this small work studio a lovely connection to the garden. Where there was once a solid wall with one fixed window, adding five French doors opened the space up to the garden. Doors can open a bedroom onto a small private deck for early morning coffee. A front door can have a view too. Even a small basement apartment can be opened up onto a garden. 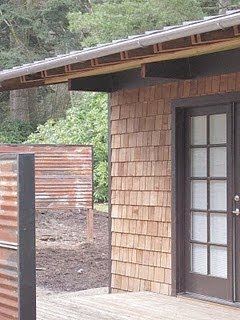 Do bathrooms need to be closed off from the garden? 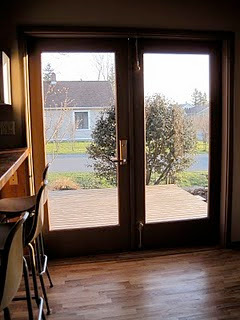 And, sometimes a whole wall of doors can open a space for total summer outdoor living. A door onto a bridge, connecting buildings results in a garden passageway. 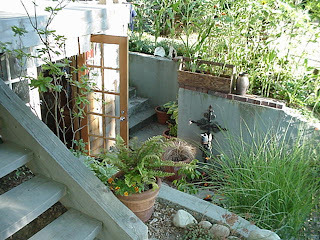 Doors can give an ugly back entry a face lift and a delightful garden connection. Relationships between interior and exterior are important in any house. In small houses with small spaces these relationships are incredibly important. 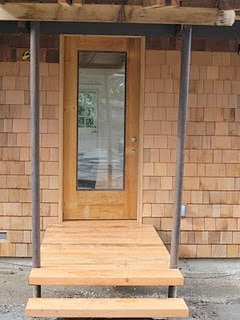 This back entry to the Bellingham House dbBrad is remodeling now has a delightful relationship with the back garden. The previous door was single and provided no indoor/outdoor flow. The dining room now has a relationship with the outside garden too, and includes a small deck for enjoying the south side of the home. Where these doors are, were once inoperable windows. Not only was there no way to access the garden, there was no way to access fresh air. Far too many homes, both old and new, neglect the relationship between the garden and the home. When the home's design focuses on this issue an almost seamless flow is created. Below, Evan has more tools than my crew! Evan helps me fix his bike. We raised the seat which was rusted but in such a way that he helped at every stage and may be able to do it himself next time. He may need to upgrade his tools from polycarbonate to steel though! Here is the mock up for a new project. It's actually going to be an architectural deer fence at the entrance to a beautiful home situated on property overlooking Bush Point. The idea evolved from a metal post fence with welded wire mesh I came upon when inspecting a barn being salvaged. The barn had giant posts and 3x16 cedar planks. Responding to the material's attributes, I decided to span further and to hang very heavy metal panels (old boiler plates). There would be three panels in each bay with spacing between them. The barn wood sold before I got there, but the idea didn't die. With a few scraps of Lois's gutter chain, the last piece of Fairground metal (see: Lois screens, FrEdLey siding, and Island County Fairground roofing), a 6x6 from the wood pile, two blocks of those infamous spruce 2x8's originally from FrEdLey project, and flashing to mimic angle iron, we worked this up. The budget is very tight so we are now looking at adapting our design without disrupting our language. Canvas panels hand-dyed by the artist owner might contribute a beautiful temporary panel in the frame work until the steel panels can be squeezed into the budget. This idea sparked from my new and ingenious collapsible steel job sign utilizing no fasteners other than bungee loops. A blog posting will follow. Following are a few shots of the south porch during the 5 days of it's construction by Matt. 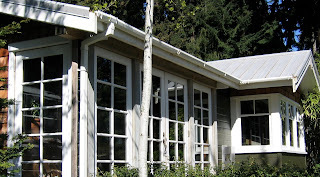 Pictures: 1)-The lightness of the porch 2)-As much light below the roof as above! 3)-profile view showing deck, steel pole, roof and board walk over wetland. Our schematic design evolved during the course of construction as Lois and I continued to contemplate her needs and wants, scope of work, cost, and materials. As a result of availability of recycled materials, the south side deck evolved. We had many 20' 2x4's from demolition of the original deck. 10' was a great length for decking so that drove the deck size. The old deck was 12' wide, so having a deck 6' deep also meant no waste--and a perfect size anyhow--just big enough to enter and to house a small table and chair. Using the last of our beautiful 2x6's from Two Dog Timberworks, remnants of steel poles from the other porch, and the 1x2's from the do-it-yourself arbor we demolished, we only had to purchase 3 sheets of Lexan, 4x10' for the lid and one 12' D.F.#1 6x6 for the beam. But, the porch was not on the plans. Correctly, the County wants to make sure it's safe. So now, off to engineering. 4)-showing that the hole is at least 36" deep, 16" around and dug in solid undisturbed soil. 5)- the construction of the deck with a permanent temp beam 6)-the 4x10 bolting deck framing to steel poles with three 3/8" x 4' lags. 7)- Matt and Dog working hard. The picture with the dog probably is the most descriptive. It clearly shows an "Another Project by dbBrad" sign. Also note the 2x6 ledger with the Simpson roll strap pre-nailed to the back side and the bolt detail on the pole Matt is carrying. And, in compliance with County regulations, the dog is on a leash! 8)-Brad torques the 1/2" x 7" bolt to secure the beam to the 2 1/2" steel pipe colums. 9)- and 10)-Matt nailing off the Simpson straps and attaching the 2x4 perlins. Matt's 200# + on a single rafter. 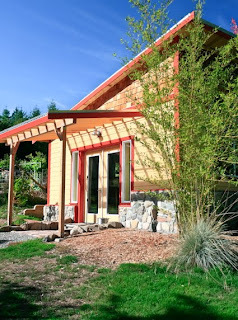 The fir from Two Dog Timberworks is easily twice as strong as that from the lumber store. Matt shaved 3/16" off the end of the rafters so the Lexan and flashing wouldn't be effected by the simpson straps on top of the rafters. 11)- the house not too long after we started. The roof and skylight had already been done. Will it stand up. That's what the great team at Reed and Associates Engineers are going to tell us.